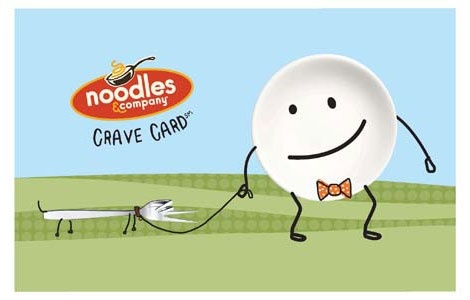 A gift card to Noodles & Company is the best way to savor dishes inspired by flavors from around the world. From healthy to indulgent and spicy to comforting, the menu includes favorites like Japanese Pan Noodles, Pesto Cavatappi, Wisconsin Mac & Cheese and Whole Grain Tuscan Fettuccine, an entrée featuring a 100% whole wheat noodle. Made fresh to order and served fast just for you. Available in any amount to satisfy any craving. Good at participating Noodles & Company locations. Protect card as you would cash. Not redeemable for cash. PLEASE NOTE: All plastic gift card sales are final and cannot be blocked, replaced, devalued, or refunded. Please treat these cards as cash.